Israel's Prime Minister Benjamin Netanyahu speaks his military secretary Brigadier General Eliezer Toledano, left, during the weekly cabinet meeting at his office, in Jerusalem, Oct. 25, 2015. Israeli Prime Minister Benjamin Netanyahu said Sunday that adding video surveillance to the sacred Jerusalem site known to Jews as the Temple Mount and Muslims as the Al-Aqsa Mosque is in Israel's best interest. He told a Cabinet meeting that the step would help to both refute claims that Israel wants to change the rules that allow Muslims to pray there but not Jews, and also to "show where the provocations are really coming from." Tensions related to fears about the rules changing have played a role in weeks of violence that left at least 10 Israelis and about 50 Palestinians dead. Also Sunday, the Israeli military said a Palestinian stabbed and moderately wounded an Israeli in the West Bank, after the victim pulled over and exited his car, which Palestinians were pelting with rocks, the military said. The Palestinian fled the scene. U.S. Secretary of State John Kerry said Saturday that Israel and Jordan agreed on specific steps to help reduce the violence, including the video monitoring. “This will provide comprehensive visibility and transparency,” Kerry said. “That could really be a game-changer in discouraging anybody from disturbing the sanctity of this holy site." He commented during a joint appearance with Jordanian Foreign Minister Nasser Judeh, in Amman. But Palestinian Foreign Minister Riyad al-Maliki quickly opposed the surveillance. Calling the system "a new trap," al-Maliki told Voice of Palestine radio Sunday he believes Israel will in turn use the videos against Muslim worshippers to arrest them for "inciting" violence. On Saturday, Israeli police killed a Palestinian man who allegedly had attempted to stab a security official at a crossing point between Israel and the Palestinian-administered West Bank. Jordanian King Abdullah II, right, meets with U.S. Secretary of State John Kerry at the Royal Palace in Amman, Jordan, Oct. 24 2015. Kerry on Saturday wrapped up days of meetings with Middle East officials on the spiraling unrest. In addition to his talks with Judeh, he met with Palestinian leader Mahmoud Abbas in Jordan. Kerry and Netanyahu had a meeting on Thursday where Kerry said the Israeli leader stressed several points, including that Israel would continue to enforce a longstanding policy on religious worship that acknowledged that "it is Muslims who pray on the Temple Mount, Haram al-Sharif, and non-Muslims who visit." Devout Jews have long prayed at the Western Wall at the foot of the compound. Kerry said Netanyahu also welcomed increased coordination between Israel and Jordan. The Jerusalem holy sites are administered by a Jordanian-appointed Islamic body known as the Waqf. In a video statement released late Saturday in Jerusalem, Netanyahu said, "Israel believes that those who visit or worship on the Temple Mount must be allowed to do so in peace, free from violence, from threats, from intimidation, and from provocations. We will continue to ensure access to the Temple Mount for peaceful worshippers and visitors, while maintaining public order and security." He also said his government will work with the Waqf "to ensure that visitors and worshippers demonstrate restraint and respect for the sanctity of the area, and all this in accordance with the respective responsibilities of the Israeli authorities and the Jordanian Waqf." 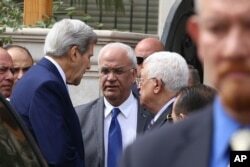 U.S. Secretary of State John Kerry, center left speaks with Palestinian President Mahmoud Abbas center right, and close aide to Abbas, Saeb Erekat, center, after their meeting at Abbas's residence in Amman, Jordan, Oct. 24, 2015. Kerry said in Amman that further talks will be necessary to arrange details and that his special envoy for Israeli-Palestinian issues, Frank Lowenstein, will remain in Jordan for more meetings with senior officials. While talks to quell the unrest are underway, the broader talks aimed at establishing a Palestinian state alongside Israel remain stalled. Those negotiations broke off over a year ago. The U.S. may have a “two-pronged strategy” to encourage both sides to return to talks on a two-state solution, said Ghaith al-Omari, a Middle East analyst at the Washington Institute in the U.S. capital. “Focus on small steps but concrete steps that each side can take to show the other side that they are serious about peace,” al-Omari said. He said the U.S. should also launch a wider regional strategy that engaged more of the Arab countries that share an interest in ending the Israel-Palestinian conflict. Chris Hannas and Victoria Macchi contributed to this report from Washington.